Pathlighter Lighted Walking Adjustable Cane (APL-36) [Lighted Walking Adj. 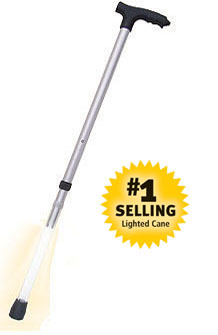 Cane APL36] - $24.95 : NewDaVincis.com!, Great Innovative Products, Gadgets and more. Including one extra Highpowered Xenon Lamp! TheÂ Pathlighter cane shines light at your feet so you can walk with greater assurance and safety. It not only provides the exceptional support of traditional orthopedic offset style canes, it offers the added safety of a light built right into the shaft to help see what surrounds you. It provides additional safety in the dark for the vision impaired as well as peace of mind for their loved ones. And because the light switch is on the end of the handle, it's easy to turn on with a simple push of a button. Adjustable height 34" - 38"